Loader crane manufacturer Hyva has introduced an electric power system, E-Power, which has been initially applied on the Kennis Rolloader crane K14. “This initiative represents an important step for Hyva in offering electric solutions on its products and systems, responding to customer requirements and market trends for increased sustainability,” said the manufacturer. In the Kennis E-Power, the conventional diesel engine is substituted with an electric engine unit, comprised of a battery pack, an electric motor, a smart electronic control system which optimises power supply and a display which shows the battery status. It features an MRT (multiple rotor transmission) powertrain system by IET, with permanent magnet motor (PMAC) and controller using last generation power semiconductors; as well as a high density battery pack, also by IET, with BMS guaranteeing thermal management, performance and safety. 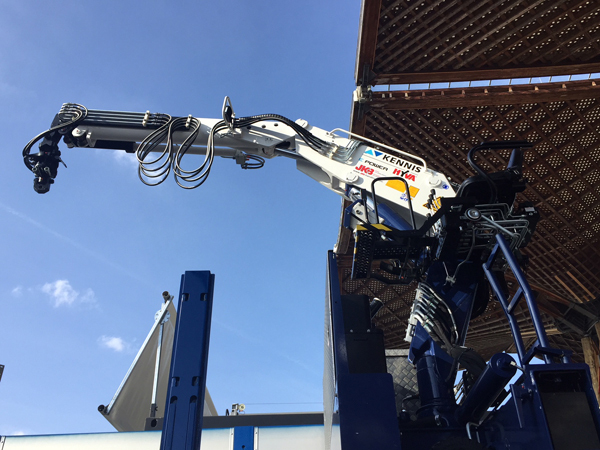 The crane can be operated when the truck engine is switched off, without noise and exhaust fumes, and it is therefore ideal for urban areas, for night work and for indoor use.